10. Dr. Maureen Robinson. (Lost In Space) In a decade of TV moms who demonstrated their domestic skills and deferred all major decisions to their husbands, she was a breath of fresh air. Unlike the mom she had played on Lassie in the 1950’s, Maureen Robinson was a distinguished biochemist as well as a wife and mother. She may not be as bold as some of the other mothers on this list but she was not afraid to tell aliens what she thought of them and on occasion does the same thing to Dr. Smith. She keeps an open mind about things, recognizing there is more to the Universe than humanity is aware of. Though the Robinson Family were indeed lost in space she remained a wonderfully balanced and nurturing mother. 9. Amanda. The mother of Spock. (Star Trek: Original Series and Movies) The life of Spock’s mother as a member of Vulcan society was decidedly constrained. In the words of an emotionally compromised Spock “My mother…..I could never tell her I loved her. An Earth woman, living on a planet where love, emotion is bad taste.” Amanda was married to Sarek, an Ambassador who was a true patriarchal figure. While she respected both her husband and the customs and values of her adopted planet, she was able to show her son how much she loved him and how proud she was of him. Amanda Grayson was a pioneer. Before her marraige she was a teacher and translator of languages with special interest in Vulcan. She worked on the development of the original Universal Translator. The actress that played Amanda in the original series and the original series movies was none other than Jane Wyatt, who in earlier years played the quintessential American 1950’s style housewife and mother Margaret Anderson on Father Knows Best. 8. 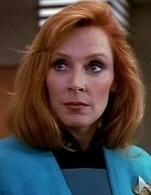 Dr. Beverly Crusher (Star Trek: The Next Generation) Beverly was the chief medical officer of the Enterprise-D, mother of Wesley Crusher, widow of Lt. Jack Crusher and confidant of Captain Jean-Luc Picard. Her deep seated ethics and loyalty made her a great mother as well a great officer. She has had a number of romances since the death of her husband but in the end it was her the devotion to her son and the crew of the Enterprise that were her most long lasting relationships. 7. Lwaxana Troi(Star Trek: The Next Generation) She carries the title of Daughter of the Fifth House, Holder of the Sacred Chalice of Rixx, Heir to the Holy Rings of Betazed. She is mother to Deanna Troi, ship’s counselor of USS Enterprise-D. Lwaxana is lusty and forward and in general often very embarrassing to her much more conservative half Human, half Betazoid daughter. As an ambassador there were many occasions where her path crossed with that of the crew of the Enterprise-D and her playful flirtations added color and humor to every encounter. 6. 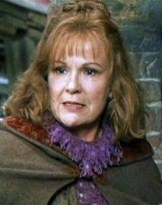 Molly Weasley (Harry Potter) Has there ever been a greater Earth mother than Molly Weasley in all the realms of fiction? I doubt it. Whether she is knitting sweaters for all of her biological and adoptive brood, cooking up a feast to rival the house elves of Hogwarts or facing down the meany of all wicked witches, Bellatrix LeStrange, Molly Weasley does everything with her whole heart. At the final battle Molly stepped in as Hermione Granger, Ginevra Weasley and Luna Lovegood dueled Bellatrix LeStrange. LeStrange had nearly hit Molly’s daughter and youngest child Ginny with the Killing Curse. Bellatrix turned to Molly and taunted: “What will happen to your children when I’ve killed you? When Mummy’s gone the same way as Freddie?” Molly replied: “You – will – never – touch – our – children – again!”, then Molly proceeded to vanquish Bella, leaving her dead on the field of battle. 5. Lily Potter. (Harry Potter) Harry Potter’s mom demonstrated another example of the strength of a mother’s love. She sacrificed her life for that of her son. Her love protected and enabled him to defeat Voldemort whose own mother had TOTALLY fallen down on the job. Lily was called the brightest witch of her generation, much as Hermione Granger was a generation later but it was her love that was her greatest contribution to the world. Lily’s kind heart reached out to Severus Snape during their childhood and though things went pear shaped for these friends, his devotion to her never died and it kept him firmly on the side of Light. 4. Jackie Tyler (Doctor Who) Jackie is Rose Tyler’s mom. (Rose is the companion that the Doctor had fallen head over sonic screwdriver for) A working class gal, Jackie wears too much make-up, too tight clothing and too dyed hair but those things don’t matter one bit when stacked up against her maternal instincts. She is willing to take on a hoard of Daleks, Cybermen or even the good Doctor himself in defense of her daughter if it comes to it. 3. Sarah Connor(Terminator) Talk about your working mothers. While waiting tables and going to college she is pursued by a cyborg seeking to kill her and thereby eliminate her future child, John Connor. How would you feel about knowing your son, who has not even been conceived is the going to be the savior of the human race? Cool, huh? Maybe not so much if you must spend the rest of your life running and fighting super strong intelligent machines as they try to destroy you and your offspring. What transfomed her from a fearful victim to a fearsome warrior? I say it was her motherly instinct. 2. Moya (Farscape) Sure she isn’t human, heck she isn’t even a carbon based life form but she is as loving and protective as any biological mom. Before she became a mother of one of her own kind, a Leviathan, she acted as a surrogate mom for her crew and passengers. She was willing to risk her own life for those who were in her care. No Borg Queen ever was willing to make such sacrifices for the collective. 1. Charity Carpenter (Dresden Files) My choice for the number 1 Sci-Fi mom is held by a character that has yet to appear in a film or on TV. She can be found in the Dresden Files. Charity is the wife of Michael Carpenter, one of the three Knights of the Cross and best friend of Wizard (now Warden) Harry Dresden. She is the mother of the seven Carpenter children. Best known of these is the eldest, Molly (Margaret Katherine Amanda Carpenter) whose magic has manifested and much to the chagrin of Charity is now an apprentice to Harry Dresden. In addition to being a full time homemaker she is also a nifty blacksmith and quite the swordswoman. She is a realist yet also a romantic. Having been rescued from a dragon by her future husband Michael might have something to do with that. She also is a woman of faith. Her faith and her family are all important to Charity. In temperament she is not unlike Molly Weasley in that both keep a close watch over their brood, are very hospitable and are not women you would want to anger. You would NOT want to be on the receiving end of their wrath. There are differences of course. Unlike Molly, Charity wants nothing to do with magic. She distrusts its practitioners and with good cause. She was almost perpetually mad at Harry Dresden because his association first with Michael and now also Molly often puts those that she loves in extreme danger. She does have a point there but she also loves Harry and has taken care of him on many an occasion. If you are looking for an ideal mother Charity is a good candidate, but not necessarily more than your own mom who doesn’t have writers to see her out of the trial and tribulations that life can bring. 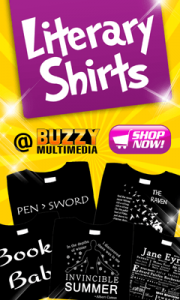 Buzzy Multimedia- Sci-Fi & Fantasy Books…Funny Shirts!